Winner of four straight National Wild Turkey Federation's National Still Target Championships! Shell Weight: 1 5/16 oz. 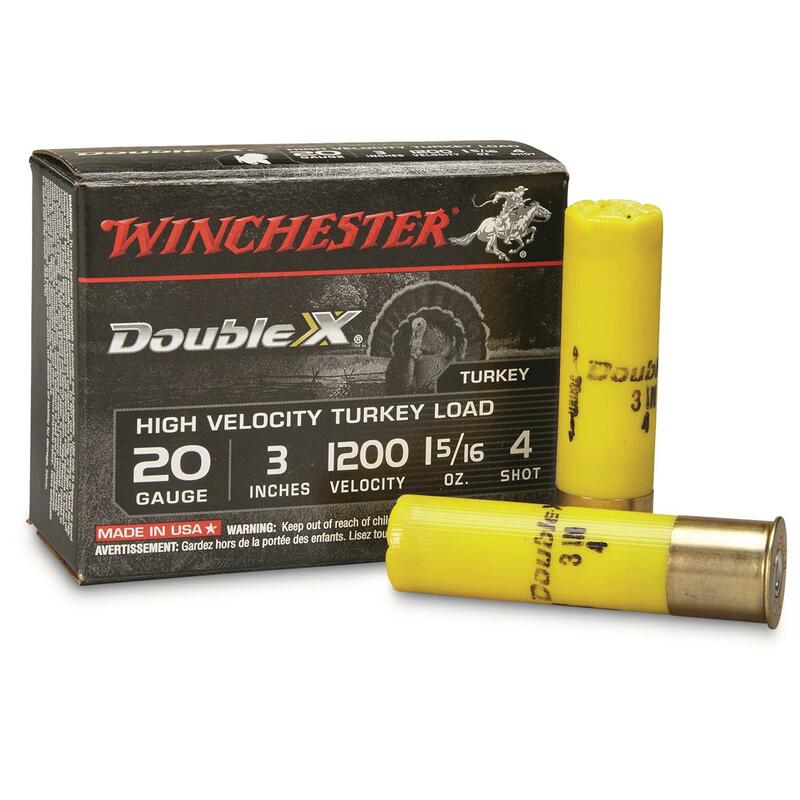 High Velocity Turkey Loads are the most technologically advanced, hardest hitting Turkey Loads ever developed! Made in the USA, they feature true magnum energy, and a scorching muzzle velocity of 1,200 FPS! 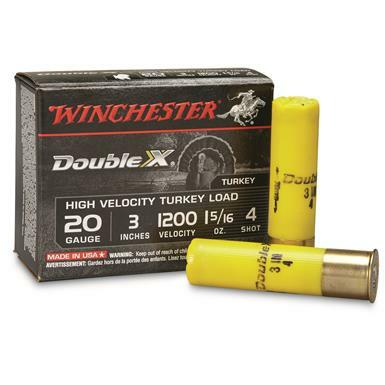 Winchester High Velocity Turkey Shotshell, 20 Gauge, Copper Plated, 3 Shell, 1 5/16 oz., 10 Rounds is rated 5.0 out of 5 by 9. Rated 5 out of 5 by Meathunter from Great Product Best round for deer and big game patterns tight has penetrating power. The extra velocity allows for less of a lead. Rated 5 out of 5 by Outlaw from Unbelievable!!! One shot, one kill, dead in it’s tracks. Shot a doe at 138 yards. Verified distance with range finder. Only one pellet hit in the kill zone. 30” improved cylinder. Found my gun patterns better with open choke tube. I love this buckshot. Rated 5 out of 5 by Hunter142 from Hammers Gobblers! Been shooting these for years back when they were named Supremes. They hit hard and have yet to let me down. Out of my Franchi Affinity with a .650 Carlsons choke I get excellent patterns out to 50 yards. I prefer these over Long Beard XR as the Long Beards are too tight up close for me. As always, pattern your gun, call em close, and introduce someone new to the sport. Rated 5 out of 5 by Axel1 from Fantastic product I use it for hunting wild boar with a beretta shotgun (a300 series - stantard full choke barrel) with great results! One day with one shot i killed a boar 100kg at 30m distance and the temperature was -15C! Great patterns also with Browning Auto5 full choke, benelli m2 full choke and benelli monte full choke! Rated 5 out of 5 by PennsyPol from ONE SHOT, THE BIRD DROPPED LIKE A TON OF BRICKS My father and I had a great season. I called in a bird for him at around 40-ish yards and he hit him (12 gauge), the bird did a whole lot of dancing, flopping, rolling etc until we got over to it. The next day I brought out the trusty 20 gauge (that my dad got me as a kid) - I was blessed enough to call a bird in at 36 yards, pulled the trigger and he went DOWN, two or three wing flaps and that was it. These put a wallop on the bird, my dad explained that he taught me everything I knew _ he will be switching to the Double X next year. Rated 5 out of 5 by tapdaddy61 from Excellent Groups! These #4's out of my Rem 870 20 gauge are the only load that patterns well with my Truglo choke. Soccer ball size groups at 30yds! Shot a tom at 33 steps last year, his chin was the first thing to hit the ground, didn't even flop. Rated 5 out of 5 by JOSHUA R / DENI from Winchester High Velocity gives tight patterns. My favorite for turkeys! Federal, Premium High Velocity, 12 Gauge, 2 3/4"
Don't risk your trophy shot with anything less.